Most people who quit smoking do so for their health. They find themselves feeling tired or short of breath after mild physical activities, and decide they need to make a change. Those who decide to quit smoking in recovery may cite similar reasons. After cutting drugs and alcohol from their lives, they feel a need to cut out all other unhealthy habits as well. You’re pulling up to a strip mall. You know that one of these storefronts houses that new AA or NA meeting you’ve been meaning to try. Unfortunately, you don’t know which one. Then you see a trash can overflowing with cigarette butts, with seven or eight people crowding around it, lighting cigarettes and chatting it up. Instinctively, you know you just found the right place. This story rings true because we strongly associate smoking with recovery culture. In light of this, many recovering addicts and alcoholics feel apprehensive when they consider whether they should quit smoking. Just as many of us improved our social life by engaging in substance abuse, we associate cigarettes with our ability to socialize before and after meetings. Does this mean you can’t quit smoking and still stay sober? Of course not. But there are a couple of viewpoints you might wish to consider before making your choice. 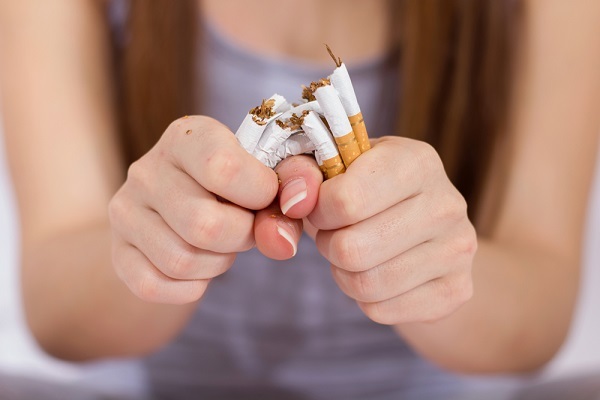 There are four primary reasons to quit smoking as identified by the American Lung Association. And given how often we smoke with other people, it may surprise you to learn that social reasons claim a spot on the list. This may sound like a reference to secondhand smoke, which certainly merits some concern. But smoking affects our social lives in a number of ways. As your senses become clearer in sobriety, you’ll likely notice at some point that cigarette smoke smells stronger than it used to. You smell it on your clothes, your hair, and even your own breath. You may even catch that same scent on furniture you use when you come inside from a smoke break. Those of us who smoke frequently are sometimes startled to learn that this is how we smell to non-smokers all of the time. If we wish to expand our social network outside of meetings, eliminating this odor will make things easier. Our financial lives become much easier when we quit smoking as well. The American Lung Association points out that one pack a day at $5 per pack would put us back a good $1,825 per year. 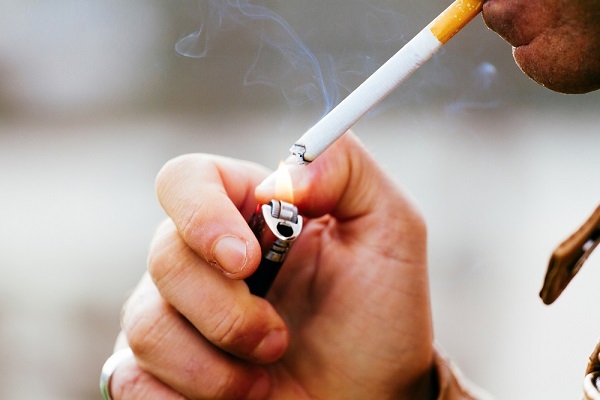 Now raise your hand if you laughed when you read “$5 per pack.” That rate is a steal in most places, yet to quit smoking at that rate would still add up to two or three months’ rent in an affordable apartment. If you came into recovery scrounging for cash, you essentially face two choices. Either quit smoking, or become that friend who always bums off of everyone. There’s nothing wrong with choosing the latter. Just prepare yourself to face some resentments from your sober living community. Her last statement alludes to the fourth reason to quit smoking: health. We primarily associate cigarettes with lung cancer, shortness of breath, poor dental hygiene, high blood pressure and dry skin. But a list posted by SmokeFree.gov shows the potential side effects of smoking to reach far beyond these key issues. If any of these side effects sounds particularly unfavorable to you, then you may wish to quit smoking—or at least cut back a bit. Social pressure constitutes one of the biggest roadblocks faced by those who wish to quit smoking in recovery. In this case, however, the pressure exists largely in the smoker’s mind. Most people don’t care whether you light up or not. They might even encourage you to quit smoking—especially if you have a full pack that you’ll need to give away to fight temptation. But with so many smokers in recovery, you’ll be around cigarettes quite a bit. There’s a saying in AA that those who hang around a barbershop long enough will eventually get a haircut. This expression aims to keep recovering alcoholics out of bars, but it applies here as well. If you don’t think you can manage to quit smoking while constantly surrounded by cigarette smoke, you might prefer to put it off for now. We aren’t saying that you should give up any time something is difficult. But many old-timers in AA and NA suggest avoiding major decisions for the first year of recovery. Naturally, some decisions cannot be avoided. But the decision to quit smoking can usually wait a few months if you think it will add too much stress to your life. 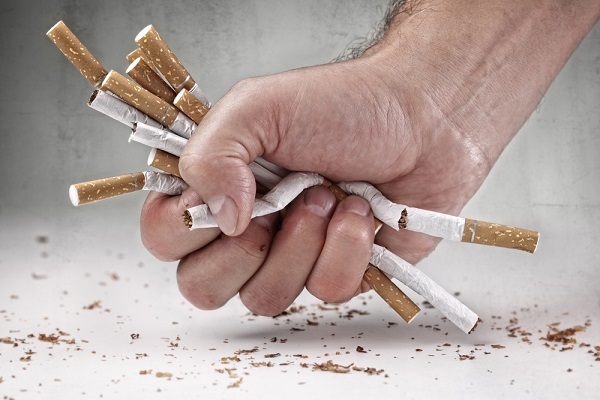 Our client expresses a common side effect experienced by those who quit smoking: loss of control. Not only do we snap at people, but we often begin eating more as well. Those who suffer self-esteem issues will find this side effect particularly disagreeable if they can’t manage to keep it to a minimum. In addition to weight gain, many find that their decision to stop smoking leaves them depressed or lethargic. 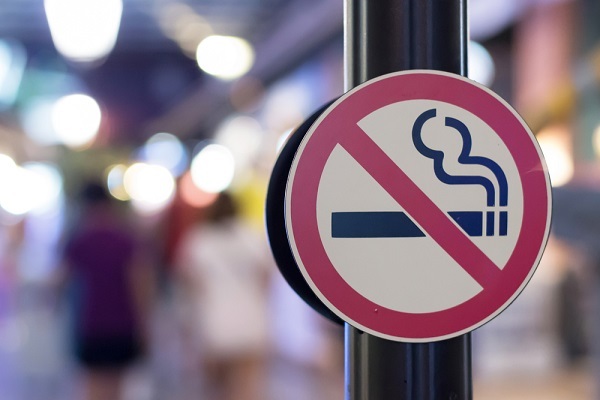 And despite the fact that smoking usually stimulates us, some of those we spoke to on the matter said they experienced difficulty sleeping without that last cigarette of the night. When something works for your recovery, most suggest that you keep doing it. Eventually, you might wish to quit smoking. But if you don’t think you can handle the added stress, weight gain, and general loss of ability to perform certain activities such as sleeping or clearing your mind without smoking a cigarette first, then there’s no need to take on this particular burden just yet. Always remember to take recovery one day at a time. Some of us need to get our feet more firmly beneath us before we can quit smoking successfully. That’s nothing to feel ashamed about. After reading over the advantages of quitting, as well as the challenges of doing so, you should feel a bit more prepared to make your choice. If you decide to quit smoking, or even to simply cut back, you will need a game plan. The following seven tips should help you out a bit. 1. Be Accountable – Tell someone in your support network that you plan to quit smoking. If you simply intend to cut back, tell them how much. Half a pack per day? No more than three cigarettes? Make sure they’re willing to say something if they catch you lighting up. And if they ask how many you’ve had that day, be honest. Also make sure to tell on yourself when needed. Letting your supporter know when you’ve gone back on your pledge to quit smoking may just be humbling enough to keep you from doing it again. 2. Find a Substitute – For many people, this means vaping. But you can find your own preferred method of filling the void. Some people try eating breath mints every time they wish to smoke. Not only does it fulfill their oral fixation, but it reminds them how clean their breath smells and causes them to actively recoil from the idea of smoking a cigarette. Figure out what works for you. And if you do take up vaping, be respectful about it. You might think it’s less intrusive to fill someone’s personal space with blueberry-scented vapor than to blow smoke in their face, and you’re technically right. But it still doesn’t rank too high in terms of etiquette. When you tell someone that you’re trying to do something, you’re essentially telling them that you haven’t succeeded yet. Stop trying to quit smoking and just quit smoking. It won’t necessarily be easy to adopt that mindset, but you’ll find it much easier if you define yourself as a non-smoker rather than someone who’s struggling to change. 4. Celebrate Successes – If you go through a day without exceeding your goal, or without smoking at all, give yourself a reward. It might be an hour of video games, or a piece of chocolate cake. Whatever works for you. Learn to associate smoke-free living with gratitude. Eventually, you’ll feel grateful even without the reward. 5. Know Your Triggers – As with any addiction, we often feel cravings to smoke when triggered by certain associations. Try making a written list. Do you smoke before every meal? After every meal? During every cup of coffee? If you know the most common triggers, be they events or simply times of day, it will be easier to prepare yourself for them. So figure out your reasons to quit smoking, and be honest with yourself about whether these reasons will hold you accountable. You might need to reassess your motivations and find better ones. 7. Be Flexible – If something doesn’t work for you, adjust your methods. One of our drivers has a pack of nicotine gum in his car. It remains unopened after two years. Gum might be your thing. Then again, maybe you find patches more helpful. You might just need to quiet your cravings through the 4-7-8 breathing method, or even sheer willpower. One last note on the above tip: flexibility sometimes means forgiveness. If one of your methods doesn’t work for you, then you might find yourself smoking again. It’s not the end of the world. Keep adjusting until you get it right. Nobody who quits drugs or alcohol should ever feel too weak-willed to quit smoking. With faith and dedication, you can manage to kick the habit. We believe in you.